Gromit is Wallace’s long-suffering loyal dog, who is often railroaded into helping with his master’s madcap plans despite his better judgement. Cultured and sensitive, Gromit would rather spend his days reading Dogstoevsky than getting Wallace out of his latest self-made scrape. But when the chips are down, Gromit shows extraordinary courage and initiative and will risk everything to save his master. He is definitely the brains of the pair, but Wallace remains blithely unaware of Gromit’s enormous contribution to his schemes. Following in the hugely popular paw prints of his predecessor please smile delightfully at this delicious hanging ornament. 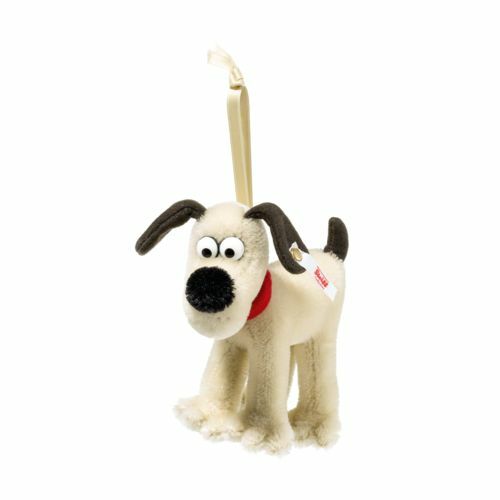 Join with us in celebrating Aardman Animation’s 40th Anniversary with this internationally famous and much loved canine, one of the best-known and best-loved stars to come out of the UK. "Won’t you come in? We were just about to have some cheese."